"Fortunately, I grew up in a culture that to this day values traditional crafts." Fiber artist Tess McGuire grew up in Switzerland and loved knitting from an early age. She discovered felting about ten years ago and became fascinated with the process that involves hot water, soap, and friction to turn a loosely knitted fabric into a warm, solid, and virtually waterproof garment. McGuire has been experimenting with different shapes and colors ever since. The artist begins each hat using wool yarn on a knitting loom, then runs the knitted shapes through the hot cycle of a washing machine to felt the fibers. 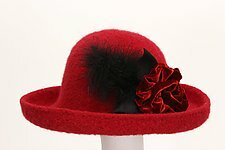 Once felted, the hats are shaped, allowed to dry, and brushed. Flowers consist of various fabrics that have a broach pin on the back for easy removal. Tess McGuire attended San Jose State University where she majored in Arts with an emphasis in Textiles. After several years of creating hats part time, McGuire took the leap and began marketing her work through craft fairs and galleries.